It’s often said that the Arctic is one of the most vulnerable places to climate change. Temperatures are climbing faster there than anywhere else on the planet. Increasing winter temperatures mean increasing amounts of rain instead of snow, and scientists are still working to understand exactly what this means on the ground. Now, a team of biologists, meteorologists and geophysicists have reviewed years of snowpack and weather data from two locations in the arctic archipelago of Svalbard and found that the increased amount of winter rain has led to more ice on the ground there. Their findings have just been published in Environmental Research Letters. The shift is so great, the researchers say, that the ground has virtually not been free from ice during winter since the beginning of this century. In other words: Santa, it’s time to buy crampons and a raincoat. Rain in places like Svalbard poses a challenge that’s less of a problem in more southerly climes. Here, at 78 degrees N, the polar night lasts for more than three months and the ground is underlain by permafrost. That means when it rains on snow, the rain can freeze at the bottom of the snowpack, creating a layer of ice. Researchers call this kind of ice formation “basal ice”, because it lies at the base of the snowpack. It can sometimes be so thick that it can completely encapsulate and kill plants, and starve animals, like reindeer, which normally graze on mosses, dwarf shrubs and other browse that they find by pawing through the snow. In a 2013 publication in Science magazine, Norwegian University of Science and Technology (NTNU) ecologist Brage Bremset Hansen and colleagues described how an extreme icing event one winter prevented voles, ptarmigan and reindeer from finding food, which caused their populations to crash. Hansen is the senior author of the newly published paper. 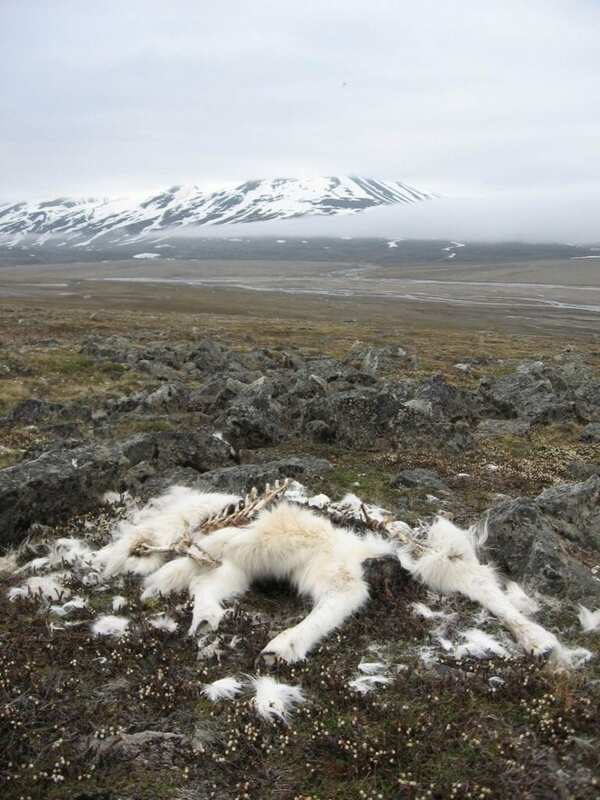 Populations of arctic foxes, which feed on the carcasses of dead reindeer, boomed as the other animals died. But in the following year, the fox population struggled, because any reindeer that had survived the big die-off had more summer food, since their overall numbers had plummeted. That meant fewer carcasses for foxes in the year after the big icing event. Basal ice can also pose problems for reindeer herders in northern communities, while rain-on-snow, even without ice formation, can saturate snow packs to the point where they can avalanche. The amount of snow that is already on the ground is an important factor in basal ice formation, the researchers say. When there’s a lot of snow on the ground and just a little rain, the rain can get soaked up by the snow and can freeze inside the pack. That means no basal ice. When there’s a thick snowpack, however, and a lot of rain, the rain can accelerate snowmelt so that lots of water cascades through the entire snowpack. It then freezes when it lands on the frozen ground at the bottom of the pack. These are the conditions that lead to the formation of a thick icy layer. The researchers wanted to know how widespread the formation of basal ice is during the winter. They examined 2539 snowpack measurements over 16 years from two locations on the main island of Spitsbergen; one on the coast in a town called Ny-Ålesund, and one in Nordenskiöld Land in the centre of the island. This last area is roughly 20 km south of the meteorological station at the Svalbard Airport in the main city of Longyearbyen. In addition to data from the two meteorological stations at Longyearbyen and Ny-Ålesund, the researchers were able to get daily average air temperatures and amount of rain from five other stations scattered across Svalbard. This allowed them to look for patterns in winter rain across both space and time. What they found was that the average amount of winter rain was more than twice as high on the coast than it was in the centre of the island. That also meant thicker basal ice on the coast. However, they also found that when it rained in the winter, it usually rained across distances of several hundred kilometers. Likewise, if the ground was covered by thick ice on the coast, the same scenario was found in the centre of the island. The bottom line is that icing tends to occur across large areas, and is not a localized event, the researchers said. As a result, animals that overwinter on the island, such as reindeer and ptarmigan, don’t always have the option of moving to a better spot with less ice. Hansen says that the most important ecological implication of the large-scale rain-on-snow events is that it can simultaneously affect all of the species in the island’s overwintering animal community. He says, however, that there is no evidence that the species that overwinter on the Svalbard tundra are currently at risk. Hansen is head of a project called INSYNC, funded by the Research Council of Norway, which is looking at how climate change affects the population dynamics of arctic wildlife communities. Extreme weather events, such as rain-on-snow, are becoming more and more common, the researchers said, and they now understand better how basal ice forms and the factors that affect its thickness and timing. But as the Arctic continues to warm, the complex relationships between rain, snowpack thickness, air temperatures and timing during the winter suggest that patterns may change, they said.